Dr Sidgi Kaballo, speaking at the University of Khartoum, November 2013. Ten weeks ago, on Wednesday 17th January, I was sitting on a busy London tube carriage on my commute to work during the morning rush hour when I saw a WhatsApp message from my mother, explaining that my father, Dr Sidgi Kaballo, had never returned home from work the day before. She feared the Sudanese authorities had detained him. As I had no signal, I anxiously waited until the train emerged back over ground before I could get to the bottom of what had happened to my old man. The District line had never felt so slow. When I finally managed to speak to my mum, she explained that many activists had already been detained the day before, for simply peacefully protesting the dire state of the economy and the austerity measures that have been imposed on the country. Knowing my father, he was most likely in attendance. The 2018 Sudanese budget saw extraordinary price hikes in basic food commodities, taking staples like bread out of the reach of ordinary families. The government removed its subsidies on all medical supplies, meaning that people relying on medicine were struggling to survive. It also decided to devalue the Sudanese currency by half, which has left Sudan with the second highest level of inflation in the world, overtaking its war-torn and poverty-stricken neighbour, South Sudan. But while education and health are severely neglected, up to 70 percent of the budget was being siphoned-off by the military, and their associated militias, to fight the many conflicts the government has decided to pursue against various regions of Sudan – as well as against the people of Yemen on behalf of the Saudi-led coalition. No one from the Sudanese intelligence services or the police contacted our family to let us know my father had been detained. We had to rely on leaked lists of detainees. My father turned 70 yesterday, and heavily relies on medicine for his diabetes and eye cataract. We had no idea whether he had access to these medicines or funds to purchase them. As the days went on, rumours began circulating about the mistreatment of prisoners; that some student activists had been electrocuted and badly tortured. I started wondering whether this was happening to my dad, and I knew my mother was thinking the same thing – but we kept our fears private so as not to worry one another. I informed my work about what happened, and they offered me a couple of days off to make sure I was ‘ok’. After just a few days, I was back at work, pretending to be ‘ok’, whilst my father sat in a cage under only God knew what conditions. My father is an old man, enjoying the twilight years of his life. He worked hard and ensured that my sister and I were old enough to look after ourselves before he returned from exile to his beloved Sudan. 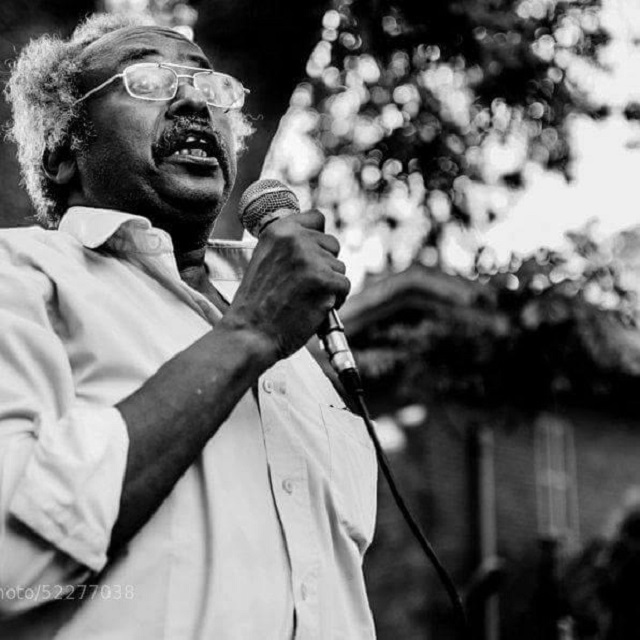 He has been spending most of his time there trying to change the country for the better, as a member of the central committee of the Sudanese Communist Party, the SCP. My father’s heart never left Sudan: in every story and every joke he ever told, Sudan was somehow involved. When I was younger, he would insist that our family holidays were always to the same destination — Sudan. He would drop us off at the airport but never board the plane with us. He couldn’t. He first sought sanctuary in Britain after came to Leeds to do his Ph.D in the 80s. During that time there was a political coup and a new military regime took control of the country which regarded my father and other influential members of the SCP as their enemies. Indeed, all political opposition was their enemy, and after seizing power, they made the country a one-party state. My father could not even go back to bury his mother. This all changed in 2005, when the Comprehensive Peace Agreement was signed in Addis Ababa, marking the start of a falteringly hopeful period. After returning to Sudan for the first time in 26 years, my father dedicated himself to grassroots activism, using his background as an economist. When he saw the 2018 proposed budget, he knew it was going to have a devastating impact on the lives of all Sudanese people. He and his party began to organise peaceful protests — as is their right under the 2005 Sudanese Constitution and the 2005 Comprehensive Peace Agreement. We now know he was detained before he even reached the protest. In actuality, the term ‘detained’ is a tad bit generous. My father has been kidnapped by the Sudanese state authorities arbitrarily and, after almost 11 weeks, has still not been charged with any crimes. He has been moved to the war-torn district of Darfur and is being held in the infamous Zalingei prison. As my father has still not been charged with any crime, we have no idea how long he will remain arbitrarily in custody. My father turned 70 yesterday. Under normal circumstances, he would fly back to the UK to be with his family on his birthday, although he would never admit that was the reason, pretending instead that he was back for a doctor’s appointment or some other innocent reason. The truth is he loves to be with his family on his birthday, he loves the birthday cake, the presents, and a handmade card from his 9-year-old granddaughter. We were planning a big celebration for his 70th;– a big Sudanese party in Birmingham. We were planning on getting a live singer and arranging for the Birmingham Sudanese community to bring food. It would have been epic. 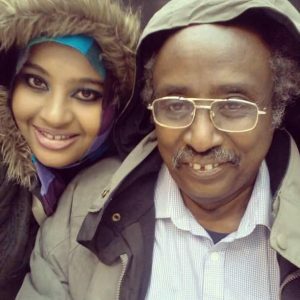 What we were not planning for, was my father forced to spend his 70th birthday inside a Sudanese dungeon thousands of miles away from his family. The UK is normalising relations with the Sudanese government at the moment, undergoing a ‘Strategic Dialogue’ on issues of mutual concern. Surely the fate of a British national languishing in a Sudanese jail should be a litmus test of this new relationship? And if it is not, then I fail to see the benefits of this so-called ‘dialogue’. For diplomatic pressure to bear fruit it is also of vital importance that we receive the support of the British public to get my father released. Otherwise, I fear his stay could turn into years, something that is sadly common in Sudan. My father is an old man who might not have years left in him. I would never forgive myself if he were to die in a Sudanese jail cell without ever being charged with an offence. I am urging you to contact your local MP and raise my father’s case with them. If you would like to write to your MP about Dr Sidgi Kaballo’s case, please contact Maddy Crowther at [email protected] to be connected to Ahmed Kaballo. Ahmed Kaballo is a British-based journalist and activist. His father, Dr Kaballo, is a member of the central committee of the Sudanese Communist Party. of course this Brother and Comrade must be released at once. Let the struggle against neo-colonialism and capitalism-imperialism be redoubled.